People frequently talk about high blood pressure, as it can lead to heart attacks, strokes and kidney failure. But low blood pressure, also known as hypotension, can also cause damage to your body. While a blood pressure reading of 140/90 mm Hg or above is considered high, a reading of less than 90/60 mm Hg is considered low. Everyone’s blood pressure drops at one time or another and doesn’t cause any noticeable symptoms. For instance, the transition from sitting or lying down to standing can cause a drop in blood pressure. Some people may experience low blood pressure right after eating or from prolonged standing. However, certain conditions can cause prolonged periods of hypotension that can be bad for your health. Such conditions include pregnancy, significant blood loss due to an injury, poor circulation caused by a heart condition, weakness that accompanies dehydration, dieting to lose weight, anaphylactic shock, infections of the bloodstream and endocrine disorders, such as diabetes, adrenal insufficiency and thyroid disease. Certain medications like beta-blockers, diuretics, tricyclic antidepressants and erectile dysfunction drugs can also cause hypotension. A deficiency of the essential vitamins B12 and folic acid can cause anemia, which in turn can lead to low blood pressure. Having persistent low blood pressure is not good. If the blood pressure gets severely low, your body will not receive enough oxygen to carry out its normal functions. A decreased oxygen level can lead to impaired functioning of the heart and brain as well as cause difficulty breathing. In certain cases, people with low blood pressure can lose consciousness or go into shock (when the organs shut down). This makes it more important to be aware of the signs and symptoms of low blood pressure, so that timely treatment can be provided. 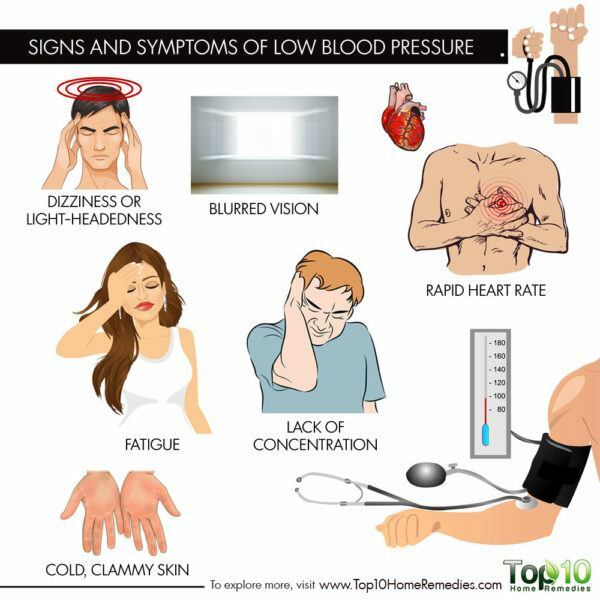 Here are the key signs and symptoms of low blood pressure. 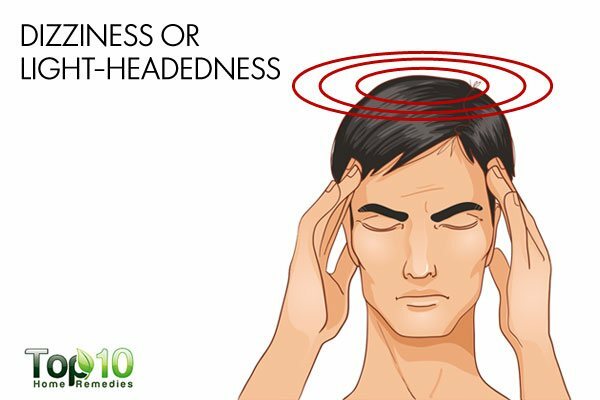 One of the key symptoms of low blood pressure is dizziness and light-headedness. Low blood pressure causes poor blood flow to the brain. This reduces the oxygen supply to the brain and makes you feel dizzy and light-headed. This is often associated with a sudden position change, such as standing too quickly after waking up in the morning. If your blood pressure is severely low, dizziness can cause fainting, too. Low blood pressure can affect your energy level and cause fatigue. The flow of blood plays a key role in the production of energy, as it provides the body with oxygen and necessary nutrients. The mitochondria within the cells need nutrients for energy production. When there is a disruption in the blood flow due to a drop in blood pressure, it disrupts the energy creation process, which in turn causes fatigue and tiredness. Even sleep disruptions caused by this change in blood volume can add to your fatigue. Having super low energy is never a good sign, so see your doctor. 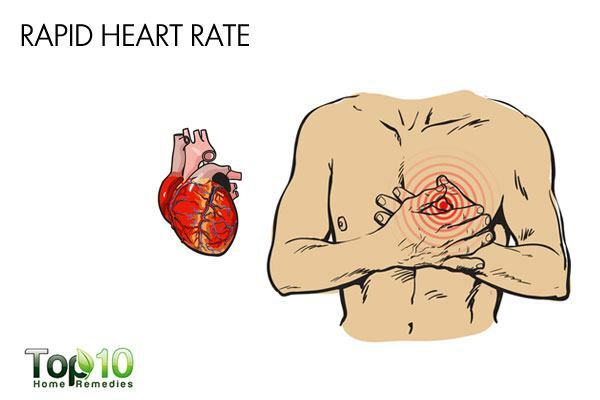 If you experience a rapid heart rate or palpitation, it may be due to a drop in your blood pressure level. Poor blood flow to the heart causes it to contract irregularly. If the heart is not getting filled with the right amount of blood, it compensates by beating faster. It can also cause your pulse and breathing to speed up. You may even notice frequent changes in body temperature. When it comes to your heart, any abnormal change should be checked by your doctor. Having cold, clammy and pale skin (not due to strenuous physical activity) could be another sign of low blood pressure, especially when accompanied by rapid heartbeat and shallow breathing. This happens when there is not enough blood circulating in your body due to a drop in blood pressure. 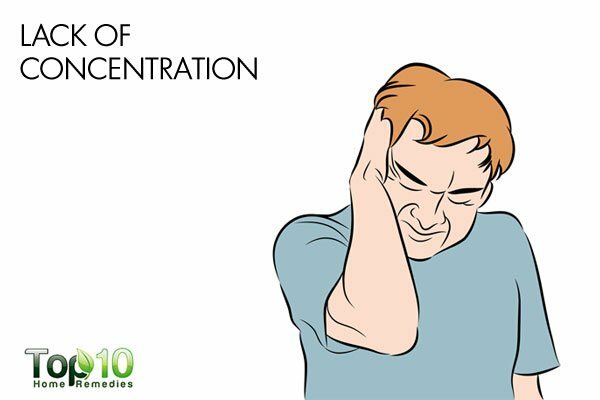 Poor concentration and focus can also be related to low blood pressure. Due to a drop in blood pressure, blood is not being moved to the brain at a normal rate. This means the brain cells are not getting the oxygen and nourishment needed to function properly. This causes difficulty concentrating in most people who have low blood pressure. If you suddenly start feeling foggy and cannot concentrate on what you’re doing despite trying hard, then get your blood pressure checked. Being unusually thirsty means your body is dehydrated, which can at times cause your blood pressure to drop. In fact, thirst is your body’s way of telling you to add more water to your blood, in an attempt to raise your blood pressure. However, dehydration or unusual thirst does not automatically signal low blood pressure. Fever, vomiting, severe diarrhea, overuse of diuretics and strenuous exercise can all lead to dehydration, which can cause your blood pressure to drop. Blurry vision is a sign of low blood pressure. Blurred vision refers to a lack of sharpness of vision resulting in the inability to see things clearly and in fine detail. The lack of oxygen and blood resulting from a drop in blood pressure affects eye movements significantly. Suddenly experiencing blurry vision is scary, and the effects can be long-lasting or even permanent. As blurry vision also can be caused by glaucoma, retinal detachment, myopia and a migraine, do not ignore this symptom. 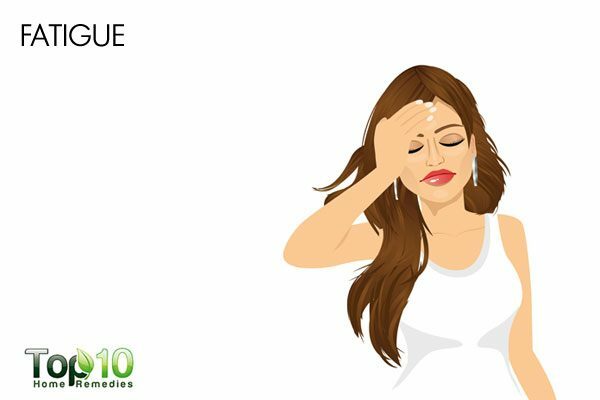 Hypotension may also cause symptoms like nausea, depression, loss of consciousness, headaches and neck stiffness, a chronic cough with sputum, pain in the upper back and poor digestion. Learn your triggers and try to avoid them as best as you can. If the underlying cause of hypotension is related to health problems, work with your doctor to resolve the health issue and take any medication that may be prescribed. Drink plenty of water to avoid a drop in blood pressure due to dehydration. Avoid standing up quickly from a sleeping or sitting position. Do not cross your legs when you sit. Eat foods rich in the essential vitamins B12 and folic acid to prevent anemia. Exercise regularly to ensure proper blood circulation throughout the day. Get enough sleep so that you feel refreshed. Avoid smoking and drinking in excess, as both can cause poor circulation. Ask your doctor about increasing your salt intake a little bit, as your body needs sodium to maintain normal blood pressure and support the adrenal system. Eat a healthy diet that includes whole grains, fruits, vegetables, and lean chicken and fish. Pregnant women with low blood pressure should consult their doctor about slightly increasing their salt intake above the normal amount. If low blood pressure persists for more than a few days, see your doctor. What’s the natural herbs remedy for hypotension or low blood pressure?